How do you stay active? A new study speaks to the health benefits of ATVing. In his last story, Wayne Hamm details his journey through Atlantic Canada with his father-in-law riding shotgun. Keep your enclosed toy carrier aired out and secure with the GateKeeper CargoScreen made by United Shade. The screen is made from a heavy duty material and comes in automatic or manual versions. When the trailer ramp is down, lower the screen to keep airflow in the unit without the invasion of insects or UV rays. The automatic motor springs, along with side channels and a bottom rail, provide a firm screen that requires no locking mechanism. A manual version is also available, which can also be securely locked. Garages and trailers can be a cluttered mess but a hanging system called the SuperHangAll—a wall-mounted track with adjustable hooks that slide along to hang gear and other apparel—can save the day. The five- and seven-inch hooks lock into place and the track can be installed at any height. There are multiple holes available for mounting on wall studs. Adding more length and hanging space is simple as track extensions snap on to existing mounted ones. 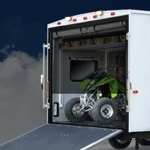 The SuperHangAll can also be installed in enclosed ATV trailers.